Cold Spring Harbor, NY — Cancer cells are often described as cells "gone bad" or "renegade." New research reveals that in some of the deadliest cases of pancreatic cancer, these rebellious cells have an unexpected addiction. Now, scientists are investigating if that addiction can be used to bring about a tumor's end. Cold Spring Harbor Laboratory (CSHL) research recently published in the journal Cell Reports, investigated this addictive behavior of cancer cells in the most aggressive of pancreatic cancer subtypes. "This version of the cancer is especially deadly," said lead author Timothy Somerville, a postdoctoral fellow in the lab of CSHL Professor Chris Vakoc, M.D., Ph.D. He explained that the average pancreatic cancer patient will survive for about two years after diagnosis. However, a notable subgroup succumbs to the disease much earlier–before the end of its first year. The Vakoc team suspects that a unique protein in the pancreas of these unfortunate patients is a cause. 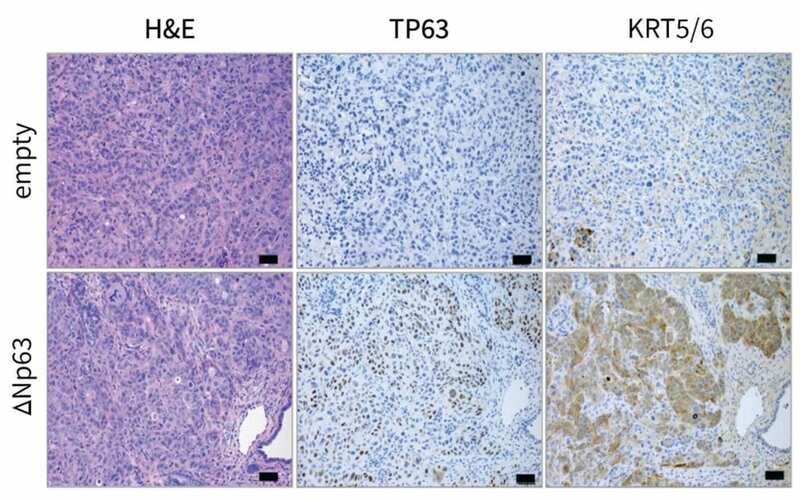 "We were able to identify a gene [and the protein it produces] called Tumor-Protein 63 (TP63) that is specifically expressed in this aggressive form of pancreatic cancer," said Somerville. Protein 63 (P63) is not normally present within pancreas cells. It is necessary for the creation of specialized cells called squamous cells. These are long, thin cells that are required for the formation of skin. When the researchers noticed P63 at work within the pancreas–nowhere near the skin–they knew something was suspicious. P63 was encouraging pancreas cells to grow into things they had no business being! Further testing revealed that having this squamous-cell-promoting gene inappropriately active within the tumor was making it very easy for new renegade cells to arise and spread to other parts of the body. However, when something is easy, there's usually a catch–even for cancer. "One of the encouraging findings is that when this happens … the cancer cells become so reliant on P63 that they actually require P63 for their continued growth," Somerville explained. "So moving forward, we're looking into approaches to suppress inappropriate P63 activity as a treatment option for patients." Another goal of the Vakoc team is to discover why the TP63 gene gets active in the pancreas of specific patients in the first place. "If we can stop it from ever happening," said Somerville, "it could be really good for the survival of this most vulnerable group of cancer patients."